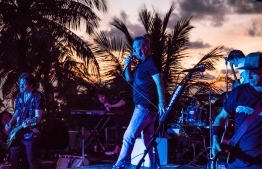 This week, Australian rock-and-roll legend Jimmy Barnes is 'making it last all night' at Holiday Inn Resort Kandooma Maldives, gifting guests and fans a once-in-a-lifetime experience to enjoy surf music performed live in an intimate space. Barnes and his Family band are the latest musicians invited to the ‘Surf Music in Paradise’ tour, hosted by Kandooma Maldives in partnership with The Perfect Wave Travel, the world’s largest surf experience travel agency, that also manages Kandooma’s surfing programme. 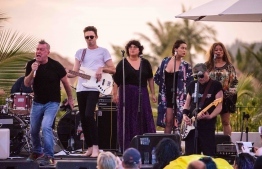 The ‘Surf Music in Paradise’ tour takes place between the 2nd and 9th of September, including three promisingly picturesque sunset-hour live performances by the man himself Jimmy Barnes and his Family band, one sunset performance by his daughter Mahalia Barnes, and an additional performance by his brother-in-law Diesel. The Surf Music in Paradise series, which kicked off in 2014, brings together surfing and music aficionados to enjoy performances by surfer-musicians exclusively in Kandooma Maldives, a luxury getaway located just 45-minutes from Velana International Airport by speedboat. 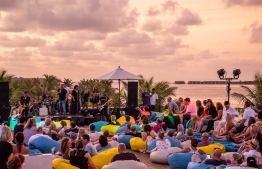 In this latest tour, Jimmy Barnes performs some of his favourite songs live with his Family band at Kandooma’s beachside to the stunning backdrop of a tropical sunset, as guests kick back or dance along after fun days spent surfing at Kandooma Right, one of the hottest surf breaks in the archipelago. According to Kandooma Maldives, viewings are limited for the unique performances, ensuring a private 'mini concert' style setting where guests enjoy a front-row personal experience with Barnes and the rest of the performers. There will also be a meet-and-greet photo opportunity for the guests after the performances. Jimmy Barnes, born James Dixon Swan, is a Scottish-Australian rock singer and songwriter. With a successful career as the lead vocalist of rock band Cold Chisel in the 70’s and 80’s, and later as a solo performer, he is one of the most popular and best-selling Australian musicians of all time.